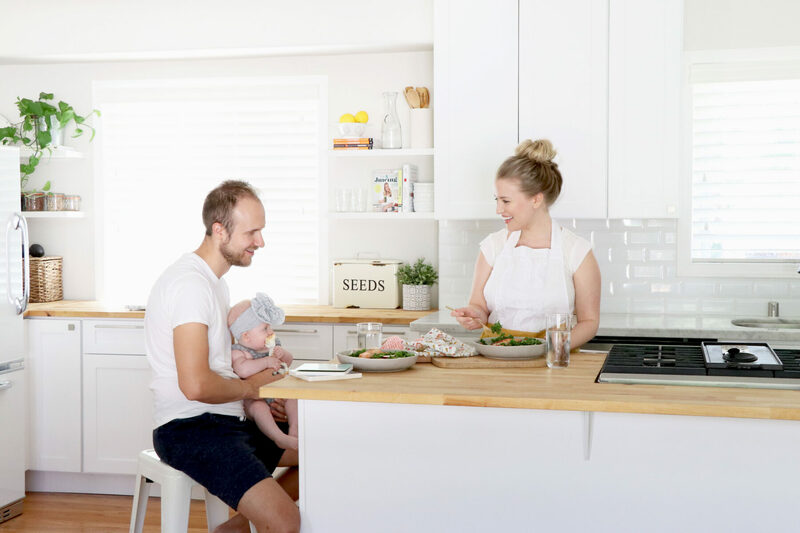 There is nothing that makes me happier than spending time with my family yet I also run a business and have a home to care for – life gets busy fast! That means I need to be incredibly efficient with my time so I can be a present mommy and wife. 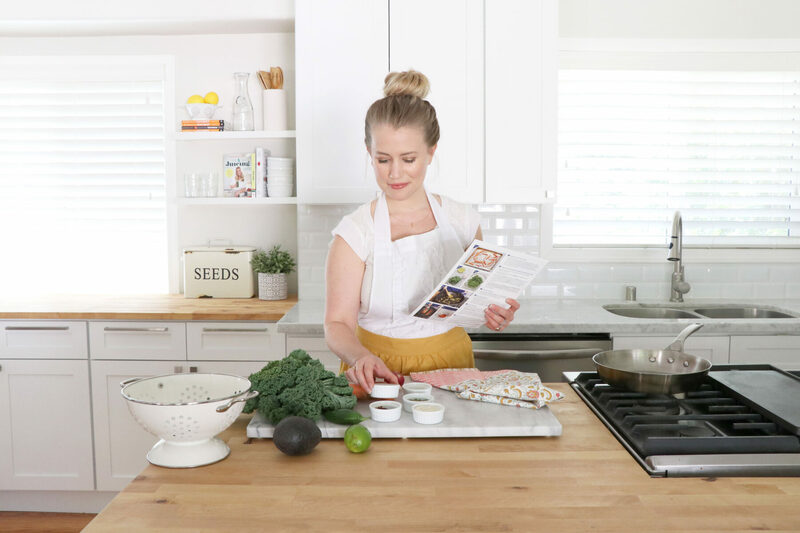 A few things that help me save time… Mom buns, dry shampoo, quick healthy meals from the Healthy Grocery Girl Blog and meal kit services like Blue Apron, which allow me to create delicious, chef-designed recipes at home – so convenient! Aaron and I create recipes for a living, which means we are thinking about, talking about and making food all of the time. By the end of the day we want an easy meal and to relax. 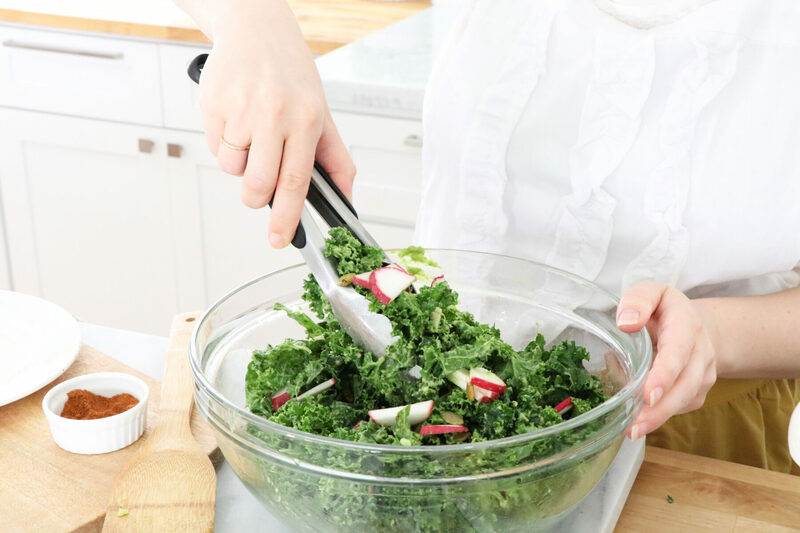 As new parents we rely on Healthy Grocery Girl Recipes, Take-Out or it’s fun to try new recipes… everyone gets stuck in a rut! Blue Apron has been a fun (and fast!) way for us to discover new flavor and ingredient combinations. 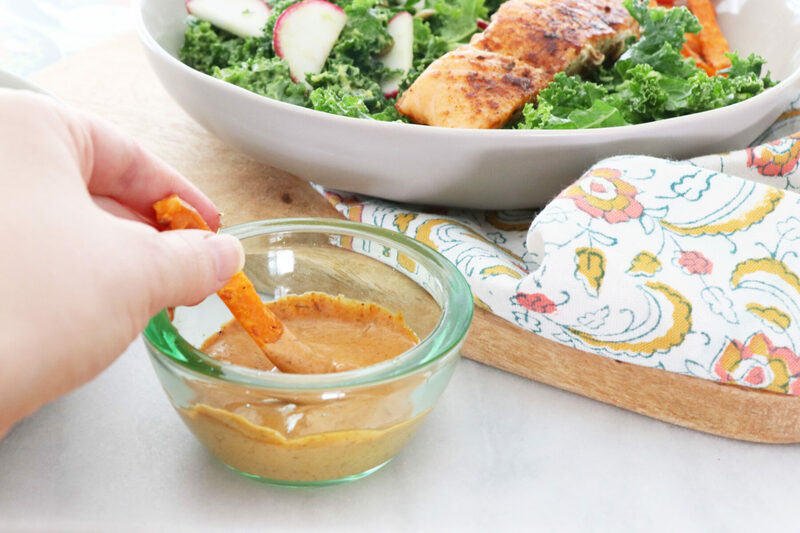 I loved the carrot fries and chipotle dipping sauce from one of our recent Blue Apron meals of Spice-Crusted Salmon & Carrot Fries with Avocado-Kale Salad & Chipotle Dipping Sauce…. Check out the photos below to see the recipe from start to finish! If you’d like to give Blue Apron a try definitely take advantage of this discount! 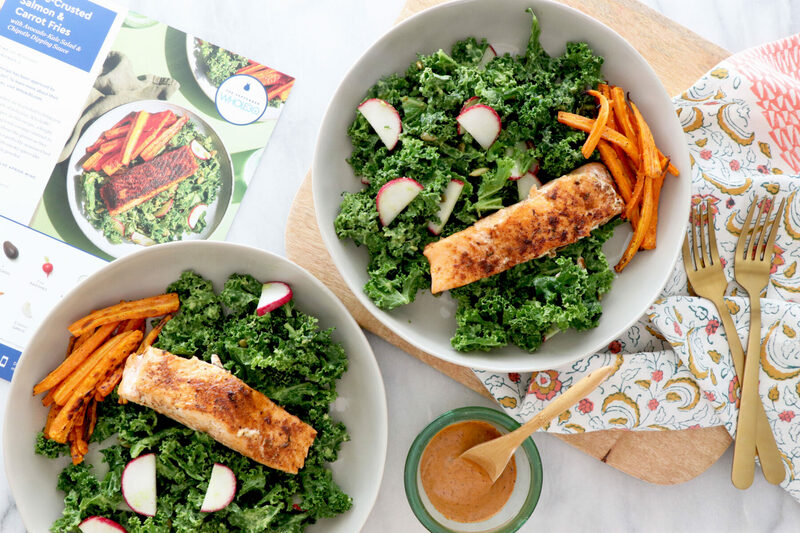 The first 50 Healthy Grocery Girl blog readers to try out Blue Apron here will get $60 off their first four weeks of Blue Apron! Each week there are 8 recipes to choose from and you can choose any combination of recipes you’d like! This is great for those with dietary preferences for example if you eat a predominately plant-based diet or are vegetarian like me! Ingredients are incredibly fresh and sourced from quality local suppliers and artisans. For example, farm-fresh seasonal produce, meat with no added hormones and sustainably sourced seafood. 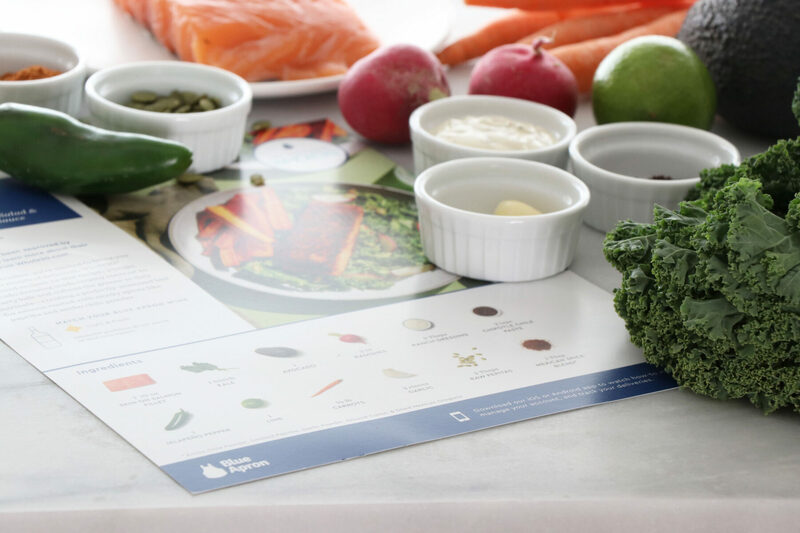 Blue Apron offers a large selection of recipes and they add new dishes to their menu every week. Recipe ingredients are delivered in a insulated box with ice packs so ingredients will stay fresh even if you’re not at home when your package arrives. Prices are also great starting as low as $7.49 per serving and meals take less than 40 minutes to prepare and the step-by-step recipe cards make it really easy to follow and create delicious, meals fast! Lastly, there’s also no commitment – you can skip or cancel the service at any time! 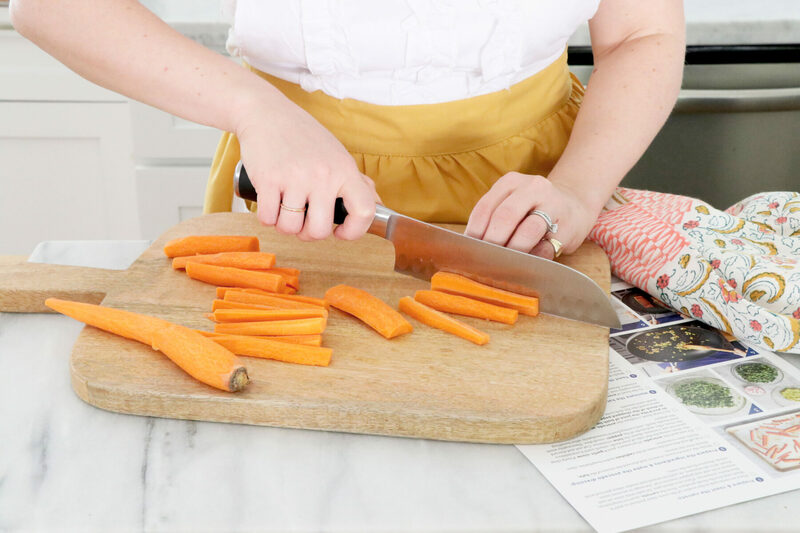 Also… Blue Apron is offering healthy Whole30 recipes during the month of September! What I love about the Whole30 program is that it’s based around eating whole, nutrient-dense foods. 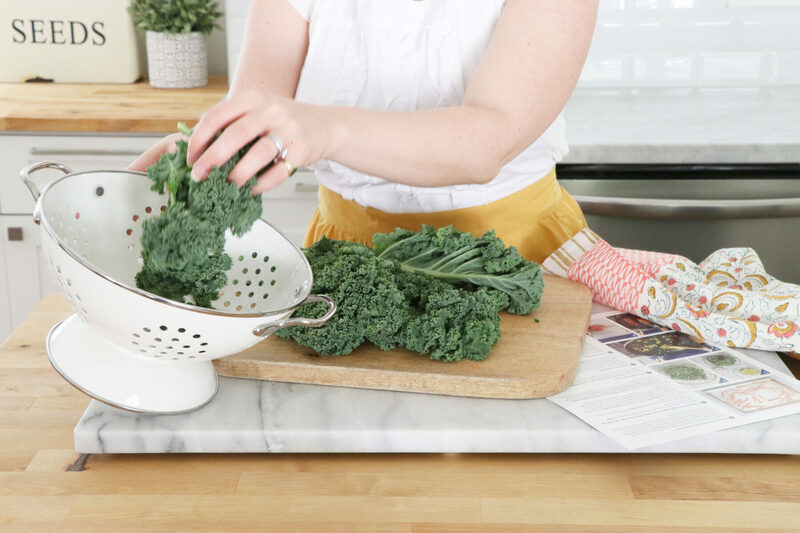 It’s not a quick-fix or weight loss plan—it’s a true reset for your cravings, metabolism, digestion, and immune system. I know personally and professionally that eating a nutrient rich diet based in real, whole, predominately plant-based foods does wonders for my health short-term and long-term. What are some ways that you save time + care for your health? I’d love to know! Share with us in the comments below! 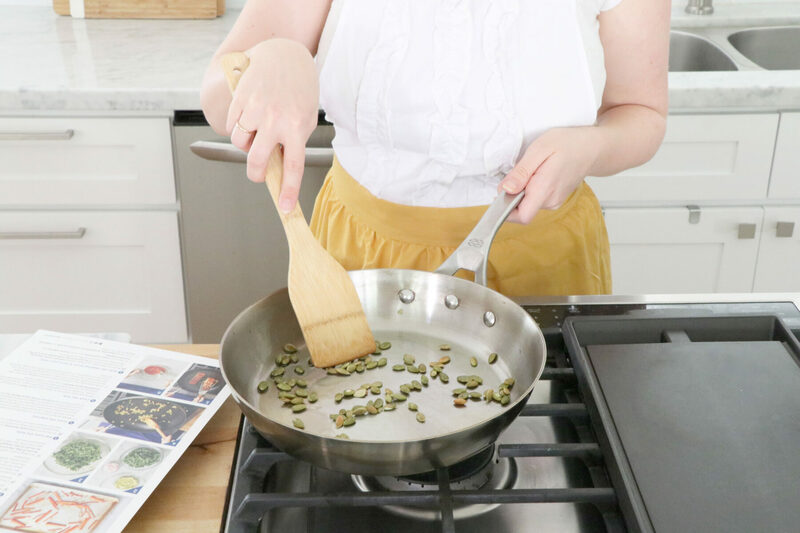 Also don’t forget the first 50 of our blog readers to try out Blue Apron here will get $60 off their first four weeks of Blue Apron! Disclosure: This post is sponsored by Blue Apron. Opinions are my own.